You know the feeling; how you fall in then out of love with a TV show? It was awesome at first but over time the show has fallen into mediocrity and convolution. The story has splintered into so many seemingly unrelated parts that following the through-line almost feels like a chore. You’re about to give up and send it away to the “personal cancellation” file, but decide to slog through to the season finale since you’re almost there anyway. Then you watch the finale and suddenly all those mediocre and confusing plot threads coalesce, and everything starts to makes sense. All of sudden not only is the show awesome again, but even the slog through the middle you endured becomes better than it was at the time because now it seems like it had purpose. 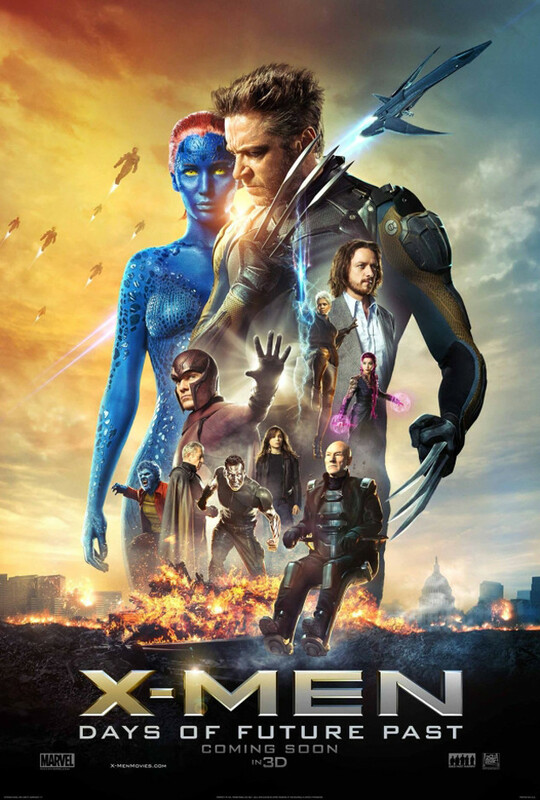 X-Men: Days of Future Past is that finale. We spend a lot of time deconstructing genre movies. We try to find the right words to explain what’s good, what’s bad, what works, and what doesn’t. However, a word that seems to rarely come up when talking about these movies is “satisfying.” Something might work. It might be good, hell, even great. My personal favorite is finding those moments that “sing.” Yet it seems like in the fantasy film genre, particularly the superhero sub-genre, we don’t often say we were satisfied by the movie we saw. Days of Future Past is satisfying. It’s satisfying as it’s own movie, as a sequel to both First Class and Last Stand, and as a cap to the X-Men series as a whole. Look, this thing’s going to make a gajillion dollars, so there’s obviously going to be more X-Men movies and spin-offs. Yet this feels like the producers could walk away and have come full circle. Personally, I loved every minute of it. I felt rewarded for my years of blind devotion to this extremely uneven movie series. It’s also satisfying as an alternate timeline reboot in the Star Trek ’09 mold. This point is important because it’s not the type of reboot that could work for every series. Time travel and alternate futures especially have always been part of the X-Men comic book canon in the same way they’re integral to the world of Star Trek. Then again, the casual film fan probably doesn’t know that about the X-Men. Yet the film does a really great job of making it plausible from the outset. Without saying too much, here’s the plot: In a dark apocalyptic future reminiscent of The Terminator, mutants and the humans that help them have been hunted near to extinction by giant, shape-shifting, mutant detecting robots called Sentinels. A group of X-Men has stayed alive by using Kitty Pryde’s (Ellen Page) ability to transfer consciousness back in time. When attacked, she sends X-Man Bishop (Omar Sy) back a few days to warn them of the attack thereby resetting the timeline. Professor X (Patrick Stewart) hatches a plan to go back to 1973 to stop the moment that led to the development of the Sentinel program: Mystique’s (Jennifer Lawrence) assassination of Sentinel inventor and mutant hater Bolivar Trask (Peter Dinklage). 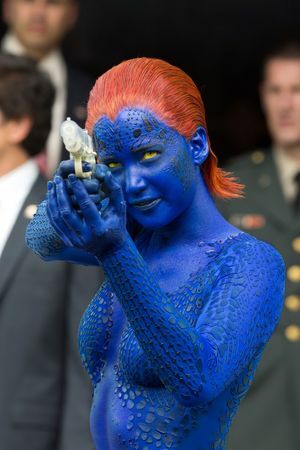 Mystique’s DNA would eventually be bio-engineered to give the Sentinels their shape-shifting ability. Professor X wants to send his own consciousness back, but Kitty fears that it will damage his mind beyond repair. Logan/Wolverine (Hugh Jackman) is tapped to go because of his healing powers. With Kitty linked to Logan while he’s back in time, she won’t be able to save them from the Sentinel’s next attack. So it’s a race against time for Logan in his 1973 body to find young Xavier (James McAvoy), who’s now addicted to a serum that gives him back the use of his legs but saps him of his telepathy. 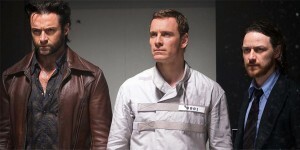 Logan then has to convince Xaiver and Beast (Nicholas Hoult) to break young Magneto (Michael Fassbender) out of the Pentagon where he’s being held prisoner for assassinating JFK. Then, he has to convince these two guys who hate each other to team up and stop Mystique, the woman both of them are in love with, and reboot the timeline. I know, I know. It seems so convoluted, yet the story is executed with such simplicity and clarity that even my time travel hating wife had no problem following it all. Bryan Singer has such a steady hand. I’ve talked before about how much of an anachronism Singer’s first X-Men movie is when watched now after all the hyperactive action fantasy that’s come since the turn of the century. Days of Future Past is a throwback to that. It’s even paced, character-driven, with no extraneous bombast. The story is organic, and the action is causal and narrative driven. As sick as we all are of giant robots they really do have everything to do with the story here. There are so many little nice moments. I’m loathe to mention too many of them because they’re really nice to discover. Everybody has already raved up and down about Quicksilver (Evan Peters) and the prison break sequence, and I won’t ruin a thing here except to say that it’s an achievement for both it’s technological prowess and it’s sense of fun. The use of period music there (and in other places) is truly inspired. Wolverine’s reentry into 1973 is wonderful. The shift in the Magneto/Mystique dynamic is poignant. McAvoy’s haunted and broken Xavier is a wonder and his journey back to hero is gripping. I could go on, but again I don’t want to ruin all the little moments that make this movie great. And the ending… Man, the ending is so, so good. It retcons The Last Stand in a way that’s both reverent to what happened in that movie yet also is a big fat middle finger to Brett Ratner and Fox for not waiting on Singer to wrap up his own story. This really feels like the last chapter of Singer’s X-Men saga. Could I nitpick? Probably, but I’d really be digging into the rhubarb to find real flaws. I will note there’s a subtle but distinct tonal difference between Singer’s take on the First Class characters and Matthew Vaughn’s handle on them. Since the next movie (X-Men: Apocalypse, teased in the post-credits scene) is supposed to focus back on the First Class cast, they should put Vaughn back in the director’s chair and have Singer produce and help develop the story. I can’t put into words what the difference is, but once you see the movie you’ll get what I mean. It’s not bad by any stretch of the imagination, just different. We all love First Class so much I feel like I should mention it. Hugh Jackman has said that after the next Wolverine movie, he’s ready to pass the baton, and if Fox execs are smart they’ll wrap his story up neatly in a way that fits into what they’ve done here in Days of Future Past. This really ties all seven(!) X-Men movies up in a nice bow. Anyway, RC says check it out.